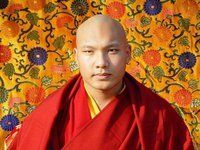 In accordance with the requests of various organisations His Holiness Karmapa has requested that his students and followers contribute to a world-wide puja to accumulate merit for his return to the Karmapa’s traditional seat at Rumtek Monastery. His Holiness has composed a prayer of dedication for this vast effort which you can see below. The puja consists of the dedication and 100 million recitations of “Karmapa Khyenno” – not personally! Click on Karmapa Khyenno for more details. By the merits thus accumulated, may it bring happiness to all sentient beings. Composed and Sealed by His Holiness the 17th Karmapa Ogyen Trinley Dorje on 18th of January, 2011 (in Gyuto, Sidhbari) in answer to the request of (Chief Advisor/ Coordinator and Honorary Secretary of )Dhungdrub Tsogpa* in Bodhgaya, May it be virtuous! Translated by Gloria SherabDrolma Chiang and Tashi D. Lharisang, proofread by 17th HHK. *The Association organizing 100 Million Mantra Recitation Puja at Rumtek Monatery, Dharma Chakra Centre, East Sikkim, India : Tib: Pal Gyalwang Karmapae Jesdan Tsogpa (Eng: H.H. the Gyalwang Karmapa Remembrance Association). This entry was posted on May 3, 2011 at 8:54 pm and is filed under HH Karmapa, News. You can follow any responses to this entry through the RSS 2.0 feed. You can leave a response, or trackback from your own site.